A cold case for 14 years. 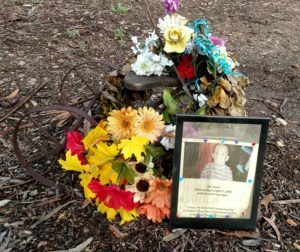 A memorial with a picture of Jahi Turner is left beside a child’s tricycle at the Golden Hill park where Tieray Jones said Jahi disappeared on April 25, 2002. On April 19, 2016, Tieray Jones was charged with Jahi’s murder. It has been 16 long years since little two-year-old Jahi Turner seemingly disappeared into thin air. Did he as the prosecution contends, die at the hands of his stepfather Tieray Jones, only to then be thrown away in the trash like garbage, never to be found? Or was Jahi accidentally injured and Tieray Jones failed to seek medical care, either through a conscious disregard or through negligence? Or could it be that Jahi was kidnapped from a park in broad daylight? These haunting questions were front and center in the murder trial of Tieray Jones, a cold case which took 14 years to charge. 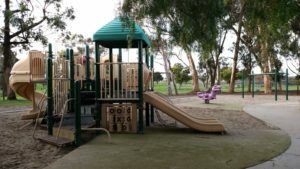 On April 25, 2002, at 2:27 in the afternoon, Tieray Jones called 911, and in a breathless and panicked voice reported his stepson had vanished from a San Diego park when he walked to a vending machine to purchase a drink for the toddler. Telling the 911 operator he had only walked a short distance, the actual length was later measured at 474 feet. Was Jones living a parent’s worst nightmare or had he concocted an elaborate lie to hide a horrible truth? But what that truth may be and what exactly happened to Jahi in the short days he lived in San Diego remains an unexplained mystery that has blanketed this case for nearly two decades. The most searing questions of all remain though: Where is Jahi Turner and will he ever be found? Despite a massive search effort and years of investigation, Jahi’s body has never been located. Nevertheless, the prosecution charged Tieray Jones with murder. Jahi Turner was born to 16-year-old Tameka Jones on February 10, 2000, in Frederick, Maryland. Tameka’s mother took care of Jahi to enable Tameka to complete her high school education. Following graduation, Tameka joined the Navy, and married Tieray Jones, a person she had known since she was 13 years old. Tameka was 18 and Tieray was 22 at their December nuptials. In February of 2002, the couple moved to San Diego to commence Tameka’s naval duties, with the plan Jahi would join them by summer. Two months after arriving in San Diego, Tameka received an urgent telephone call that child protective services had been called and she must immediately take Jahi or he “would go into the system.” Tameka’s mother was a “functioning addict,” but now her drug use would cost Jahi his home. As Tameka did not have any money to make the trip, she received assistance from a family center and Navy friends generously took up a collection to raise the necessary funds. On Sunday night, April 21, 2002, Tameka arrived back in San Diego with Jahi. He was a happy, healthy little boy, with a future seemingly bright. Early the next morning, Tameka departed on a five-day deployment not knowing she would never see her son again. On Tuesday morning, April 23, 2002, Tameka called Tieray from her Navy ship and he told her Jahi had “had a little accident.” He said Jahi was sitting on the bed when one of their cats jumped up, and Jahi fell and hit his head on the dresser. He said Jahi had a bump on his head but was fine. He further confided that Jahi had wet the bed the night before, in a bed he was sharing with Tieray as Jahi did not yet have a bed of his own. Tieray’s version of the fall would vary over time. Murder He Wrote? What Did Tieray’s Journal Entries Really Mean? Tieray and Tameka kept a journal in which they wrote to each other as a way to stay connected during their separations. The journal was found by police on top of the couple’s bedroom dresser on the day Jahi was reported missing. Although on Tuesday morning Tieray told Tameka Jahi was fine after bumping his head, his journal entry of that night revealed a different story. On Tuesday, April 23, 2002, at 7:00 p.m., Tieray wrote: “Today for some reason he hasn’t been moving or really talking. Jahi is starting to act really funny he won’t get up off the floor. He’s not walking or talking when I tell him to get his cup he just looks at me. I know it’s going to take some time. But I don’t want him hating me for something I can’t control.” Was this entry the smoking gun, showing Jahi was severely injured and moving towards death? Did Tieray know Jahi was injured, and failed to seek medical care because he had inflicted the injury? Or was there a more innocent explanation for these symptoms, such that medical care was unnecessary? Dr. Jennifer Davis, a pediatrician and child abuse expert was called by the prosecution as their medical expert. She questioned why Tieray told differing stories about the fall if it really was just an accident and stated a simple roll off the bed onto the carpeted floor would not have resulted in the types of symptoms reported. She testified that an abusive head trauma was the most common injury for a child under three, and the number one sign of abusive head trauma was lethargy, such as described in the journal. Dr. Davis pointed to stressors she found in the case which can lead to child abuse, specifically citing Jahi’s potty training accidents and bed wetting, financial stress over the lack of money, lack of food, and Tieray’s inability to purchase cigarettes. The prosecution showed Tieray was obsessed with trying to obtain money, making 44 calls on Wednesday alone seeking funds, and his frustration was running high. Tieray and Tameka had exhausted all their money for the move to San Diego and were awaiting reimbursement from the Navy. Tameka used their last $20 to take a cab to her ship, leaving Tieray without any cash for the five days she would be gone. Tieray was upset as he would not have money to even purchase cigarettes. The reimbursement funds were at last deposited, but the bank would not allow Tieray to use Tameka’s bank card without her authorization. Resorting to extreme measures, he called the bank and pretended to be a woman, and even persuaded an ex-girlfriend to call the bank and say she was Tameka. Despite all his efforts, he still could not obtain any funds, either from the bank or from friends. To make matters worse, while on the telephone to the bank, the telephone was cut off for lack of payment. In the journal of Wednesday night, Tieray wrote, “This couldn’t be a more fucked up day.” Tieray’s quest to obtain money would continue, still trying all the way up to six minutes before he placed the 911 call. Concluding her testimony, Dr. Davis rendered her opinion Jahi had suffered a severe injury, possibly inflicted, and had likely died as a result of failure to seek medical care. She did acknowledge on cross-examination that without a body there was no way to tell whether the injury was intentional or accidental, and confirmed she had never testified in a no body case. The defense countered with their own pediatrician and child abuse expert, Dr. Frederic Bruhn. He testified he could not render a medical opinion or come to any conclusion about what had happened without more information and objective evidence, such as an in-person examination, a body, autopsy report, photographs, or x-rays. By just what was written in the journal, there was not enough to ascertain whether Jahi needed medical attention he further concluded. He then pointed to the journal entry of the next morning which indicated Jahi was better, causing Dr. Bruhn to opine it wasn’t a serious injury. He cited other reasons which could have caused the reported symptoms, including homesickness, fatigue, disrupted sleep pattern, or intercurrent illness. Dr. Bruhn ultimately did not believe there was enough proof to make any definitive conclusion. In a move that surprised many, Tieray Jones took the witness stand in his own defense. Deputy Public Defender Courtney Cutter gently walked him through the journal entries. He had written the bump on Jahi’s head had gone down, he had put ice on it, and he did not think that was what was wrong with Jahi. When asked by attorney Cutter if he thought the bump on Jahi’s head had anything to do with the symptoms, he answered, “No.” It was nothing that would make him think he needed to go to the hospital either. Tieray testified he thought Jahi “had just had it, had hit that homesick wall.” He further wrote how he thought “Jahi was just coming around.” Tieray explained the journal entry, “I don’t want him hating me for something I can’t control,” was not about losing his temper, but about not wanting Jahi to hate him because Jahi had to be removed from his grandmother’s home so suddenly. On Wednesday morning, April 24, 2002, the morning after Tieray detailed Jahi’s symptoms in the journal, Tieray’s neighbor saw Tieray coming down the stairs with two large black trash bags that were really rounded and did not look like trash. They made eye contact and Tieray glanced away really quickly. He headed to a further trash bin than the one closest to their apartment. He soon carried out another black trash bag that was less full and looked like normal trash. Another neighbor saw Tieray carrying out a white trash bag. Neither neighbor ever saw him with a child. Prior to Tieray’s 911 call at 2:27 p.m., Tieray attempted to reach Tameka on her Navy ship in a succession of five emergency telephone calls. On Thursday, April 25, 2002, he made morning calls at 11:39, 11:40, 11:45, 11:57, and 12:03 frantically trying to reach Tameka. He left voicemail messages stating, “It is an emergency.” When pressed in one police interview as to what was so urgent, Tieray terminated the interview. Tieray’s 911 call sparked a massive police response, with officers immediately descending upon the park. Officers with young children of their own felt the weight of the reported missing child, and in no time at all it seemed as if every police officer in San Diego was searching for Jahi Turner. Helicopters and police dogs were brought in for the desperate search. In the midst of it all, Tieray stood out for his ever-changing story. Tieray initially told Officer Lisa Davies, one of the first police officers who arrived at the park within minutes, that he left for the park at 1:00 p.m., he did not bring Jahi’s cup to the park, and he left Jahi at the playground while he walked to the vending machine. Within an hour, Tieray told a different version, telling Officer Dana Hoover he left for the park at 10:00 a.m., he did bring Jahi’s cup, and Jahi was following behind him to the vending machine, although he never once looked back to ensure Jahi was still behind him. Tieray, never shying away from a police interview, ultimately gave four videotaped interviews, two on the day he reported Jahi missing, one the next morning, and one the following week. In an interview with Detective David Walker the day after he reported Jahi missing, Tieray said his son’s mother, Lizette, called right before he left for the park. He was just getting up from a nap, so it was after 1:00 p.m. when he left for the park he continued. Having had enough, Detective Walker let Tieray have it. “I think you are slick. Three witnesses saw you come back to your apartment alone at noon,” he said in an aggressive manner. Tieray responded that it was not possible because he was in the apartment until a little after 1:00 p.m., and the only time he left the apartment was to go to the park. In an interview with Detective Lynn Rydalch, Tieray told him he left for the park around 1:00 p.m. He also wrote out a statement he received a telephone call from Lizette after 1:00 p.m., and then left for the park. 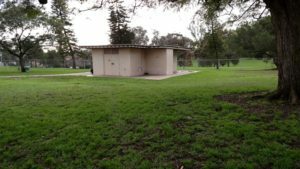 To Detective Torgersen, Tieray said he and Jahi had lunch around 11:00 a.m., took a nap, and then got to the park around 1:15 p.m. or 1:20 p.m. Tieray was then confronted with the fact he could not have been napping, as his telephone records showed he was on the telephone. Tieray would stick with the 1:00 time frame for 16 years, only deviating from it at trial, bringing tears of outrage to Tameka. Jackie Howard, who also had a child with Tieray, talked to Tieray on the day he reported Jahi missing. In fact, his contact with Jackie on that day was extensive. Telephone records revealed there were calls at 11:14 a.m., 11:32 a.m., 1:51 a.m., 2:09 p.m. and 2:11 p.m., which were all before Tieray called 911. After Tieray called 911, he again called Jackie at 2:40 p.m. During one of the morning calls, Jackie Howard testified Tieray told her Jahi was in daycare at the base. Neither did he ever tell Jackie he had lost Jahi, and he was out looking for his missing son. Another witness, Ortia Watson, who lived in the same apartment complex as Tieray testified as she was driving home she saw Tieray walking by himself by the Food Bowl Market close to noon on that Thursday, April 25th. Back at the apartment, while she was eating lunch with two other neighbors, they all witnessed Tieray walk by them and to his apartment. She testified Tieray’s demeanor was like a “normal person talking a stroll.” When Tieray was asked by Detective Rydalch if he went to the Food Bowl Market or near it on that Thursday, he did not answer, prompting Detective Rydalch to say, “It’s a simple question.” Tieray finally responded, “Yeah, to try to get some money.” When asked why the three people saw him walking into the complex by himself that day, without Jahi, Tieray says he doesn’t know. He then said he did not want to answer any more questions. It was the last time Tieray would speak with any of the detectives. Why Did No One See Jahi at the Park? The prosecution called seven witnesses who had been at the park and playground with their children, and they all testified they never saw Jahi at the park. None of them saw a frantic parent looking for or calling out for a missing child either. The Golden Hill park on 28th and Cedar where Tieray Jones said Jahi disappeared. 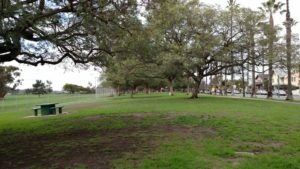 This is what the park looks like at the time of the preliminary hearing in 2016. Tieray told police he left Jahi at the playground while he walked to purchase a drink for him. The distance was later measured at 474 feet from the playground to the vending machine. A vending machine was next to this bathroom where Tieray said he tried to purchase a drink for Jahi. The vending machine is no longer there. On the witness stand, Tieray abandoned the 1:00 p.m. time frame which he had clung to for 16 years, and now said he really took Jahi to the park at 10:00 a.m He said he sat under a tree near the playground, and smoked marijuana while Jahi played on the playground. Under a blistering cross-examination, Deputy District Attorney Bill Mitchell asked Tieray if he made up this new timeline only after listening to all the witnesses testify at the trial, and he was now trying to make his story fit with the testimony. Tieray denied the accusation. Tieray revealed for the first time he actually lost Jahi in the morning, but did not call 911 until 2:27 p.m., some three to four hours later. Tieray explained his long delay in calling for help was because he was in fear of being arrested for his misdemeanor marijuana warrant from Maryland, was afraid of losing Tameka, and was afraid of breaking up the family. Through tears, he also said he was ashamed he had lost Jahi. Asked by attorney Cutter how he was feeling, he said, “worthless.” He continued, “She gave me one job and I screwed it up.” He explained the emergency telephone calls to Tameka were so Tameka could instead call 911. (Tameka testified Tieray told her the emergency calls were about the ATM card). Unable to reach Tameka, he walked back to the apartment at noon, which is why the witnesses say him there alone at noon. When Tameka did not call back, he knew he had to call the police. He walked back to the park. But before calling 911, he talked to Jackie at 1:51 p.m., received a call from Lizette at 1:57 p.m., then called Jackie again at 2:09 p.m. and 2:11 p.m. He finally called 911 at 2:27 p.m., stating he had last seen Jahi 15-20 minutes before. Under cross-examination, Tieray admitted he lied to the 911 operator about how far it was to the vending machine, when he last saw Jahi, and that he had been knocking on doors looking for Jahi. Tieray further admitted he lied to detectives throughout his interviews and had lied to Tameka for 16 years. His lying was so pervasive, Judge Weber would later say attorney Mitchell had impeached Tieray severely, proved he was a liar, and although there were unknowns in the case, what was not in dispute was that Tieray lied repeatedly. During the search of Tieray’s complex, police found soiled bedding and clothes belonging to Jahi discarded in a dumpster. Dorie Savage, who had been a forensic crime scene specialist before her retirement, described the clothes as child’s overalls, a Winnie-the-Pooh shirt, toddler jacket, and jeans. Tieray explained there had been a box of clothes for the Goodwill in their home, and since he did not have a working car, he decided to throw the box of clothes out. The clothes were infant size three, much too small for Jahi. However, the yellow jacket and jeans currently fit Jahi and were still discarded. They had urine on them, as did the sheets from the master bedroom. Did Jahi wet the bed more than the one time Tieray revealed? Or did Tieray simply throw away the clothes instead of laundering them as he said? Dorie Savige remembered Tieray well as when she processed him the day he reported Jahi missing, he was friendly and talkative, and even offered to share his fried chicken recipe with her. Jahi’s beloved Elmo blanket and a onesie tested positive for his blood. The defense brought out through witnesses that the blood could have been present as Jahi had a nosebleed in Maryland, and had eczema, causing him at times to scratch until he bled. Did the Police Search the Wrong Landfill? Beginning on April 30, 2002, a ten-day search of the Miramar landfill took place, with officers searching 24 hours per day, raking through 5,000 tons of trash. Jahi’s body was not found. The trash from the apartment complex was also taken to a transfer station and then to the Otay Mesa landfill. The Otay Mesa landfill was never searched as it was deemed too dangerous because of the presence of bio solid waste. Was Jahi’s body at the Otay Mesa landfill? On the witness stand Tieray revealed he pled guilty to assault in Maryland and was incarcerated from October 2004 through May 2008. The marriage had already been in trouble and in 2004, Tameka decided she wanted to separate. Tameka testified Tieray was upset about separating, and he told her if she divorced him, “you will never really know what happened.” Tameka believed this statement was about Jahi. Tieray testified it was about his unfaithfulness in seeing another woman. Although Tameka and Tieray separated in 2004, they did not officially divorce until 2013. As they had a son together after Jahi’s disappearance, their lives were still connected, although Tameka testified Tieray was only an occasional father. Tieray testified Tameka would at times keep the child from him. In 2013, Tameka received a “call out of the blue” from Tieray, who was now living in North Carolina, and he was very upset as he heard police had found Jahi in a bag, deceased. The call so upset Tameka she immediately contacted a detective in San Diego. For all the years she had been a believer, a believer in Tieray, a believer in the story he had told her, and most fervently a believer that her baby was coming home to her. With this telephone call she began to have doubts and flew to San Diego to meet with the district attorney’s office and police detectives. She at last learned of Tieray’s changing stories. She had had a strained relationship with law enforcement as she believed they were unjustly targeting Tieray, but now she offered her full cooperation. She identified the clothes Tieray had thrown in the dumpster as Jahi’s. She further cooperated by making a “controlled call” to Tieray on March 17, 2015, a call which was scripted and recorded by the police. At the beginning of the telephone call Tameka told Tieray she had received a call from a San Diego detective saying that Tieray doesn’t believe Jahi is alive. Following this revelation, a long paused ensued before Tieray answered, saying, “I guess the time, presume would know something.” Tameka begins to cry as she tells him, “Can you tell me exactly what happened that day? I need to hear it from you. I want to know everything. Everything!” In the almost 23-minute call, Tieray recites the park story, tells Tameka he loves her, said he already feels the blame, and knows she had to deal with the fact that she might be married to a man who hurt her child. He says, “An accident is supposed to be an accident. Anything else would have to be my fault.” He goes on to explain that if it was an accident, he would have said it was an accident as he has never run from anything in this life. The prosecution felt this control call was very telling, as when Tieray was asked to clarify whether it was an accident, it unnerved him, and he stuttered and stammered. The new evidence gathered through Tameka’s cooperation, the control call, and further scientific testing including forensic serology (DNA/blood found on the onesie), was what helped propel the case to finally being charged. After listening to the case, Judge Joan Weber ruled she must give an involuntary manslaughter instruction sua sponte, meaning on her own accord. Jurors may be instructed they can find a defendant guilty of the most serious crime charged, or of a lesser included offense of that crime. In this case, a lesser included offense of murder is involuntary manslaughter. The jurors would be tasked with deciding whether the prosecution had proved beyond a reasonable doubt that Tieray Jones was guilty of second-degree murder, involuntary manslaughter, or whether they should acquit him. Was there evidence of second-degree murder, an implied malice murder? The threshold for such is high, and jurors must find the killing resulted from: 1.) an intentional act or failure to act; 2.) the natural consequences are dangerous to human life; 3.) the defendant knew it was dangerous to human life, and 4.) had a conscious disregard for human life. Involuntary manslaughter is an unlawful killing, without the intent to kill. In this case, the negligent act of failing to seek medical care for Jahi would qualify for involuntary manslaughter. In the late afternoon of March 13, 2018, after a four-week trial, the case was finally given to the jury. After deliberating for two and a half days, the jury sent a note to Judge Weber stating they were hung. Judge Weber summoned all parties to the courtroom, and the jury foreman revealed their division. He said two jurors thought Tieray was guilty of murder, eight thought he was guilty of manslaughter, and two thought he was not guilty. Upon stating further deliberations would be futile, the final jury findings would stand at: 10 to 2 in favor of acquitting on second-degree murder and 8 to 2 in favor of convicting of involuntary manslaughter. Two jurors would not be dissuaded from second-degree murder. It was later revealed two jurors thought Jahi had been kidnapped. Finding the jury “hopelessly deadlocked,” Judge Weber declared a mistrial. Attorneys Nicole Rooney and Courtney Cutter then each argued passionately and eloquently for their respective positions. “Count one (murder) is hereby dismissed” said Judge Weber, ending the chance for a retrial and setting Tieray Jones free. Citing the discretion granted to her under Penal Code 1385, a code which allows a dismissal in the interests of justice, Judge Weber went exhaustively through the five balancing factors. She ultimately found the balance of the factors fell within the defendant’s favor and said no jury could find Tieray guilty of second-degree murder with the existing evidence. She further said it was unlikely the prosecution could come up with new evidence and witnesses at a retrial. She noted there were 45 witnesses at this trial. Judge Weber said there were four versions of what could have happened: 1.) Jahi was kidnapped from the park, which two jurors accepted; 2.) Jahi was accidentally hurt and died, which would not be murder; 3.) Jahi was accidentally hurt and Tieray disregarded that fact and watched him die, which could be murder or manslaughter; or 4.) Tieray could have intentionally abused Jahi, causing his death, which would be murder. She said there was no way for a jury to unanimously rule out any of the four options. The involuntary manslaughter charge was barred by the statute of limitations and could only come in as a lesser included offense through a murder charge, and with the defendant waiving his right to the statute of limitations defense. This charge would have been available to the prosecution had they not waited 14 years to charge Tieray Jones. Even though the case has now gone through the court system, the haunting questions still remain: Will we ever know what really happened to Jahi Turner and will he ever be found?